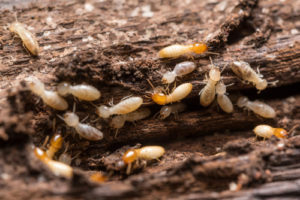 How to Spot Termites | Absolute Pest Control, Inc.
Termites are the uninvited guests that come to your house and damage your beloved property without you knowing about it in time. These tiny parasites feed off of the walls, furniture and the roof of your house and leave behind a nasty trail of feces and other dead termites. What’s worse is that they are very sneaky, they start working from the inside, so you never know what you are cohabiting. These nasty housemates will slowly eat away your home, and you will not even notice until it’s too late. These sneaky pests live in large colonies that have a caste system of their own. So, an entire culture of termites is accompanying you without you even noticing it. Termites usually feed on the cellulose found in trees and wooden objects, but they also like to include papers, the insulation between walls, swimming pool liners, and filtration systems, in their feasts. There are different ways you can spot these silent destroyers, but since they do not live out in the open, you may need a specialist to find these little critters. The first step would be to know what termites look like because many people mistake them for ants. Some termites can even fly around and may even look just like flying ants to the layman. The difference between these two is apparent when you look at their wings. Ants have larger wings in the front and smaller ones in the back, while termites have two uniform wings on each side. They also have different antennas–ants have slightly elbowed antennas and termites have straight ones. Moreover, in ants, you can easily see the segments in their body because of their thin waist, but termites have a uniform width. Not only do termites harm your house, but they can also wreak havoc in your yard, slowly. They even survive on living trees and shrubs and harm woody plants that are already on the downward spiral. Termites can be found anywhere, from the foundations of your house to bookshelves and the books on them. If you suspect that these bugs are actively consuming your house, you should inspect your house immediately. Although it may not be easy to identify an infestation in its early stages, you can always look for signs. The biggest telltale sign of termite infestation is hollowed out walls with fine dust like substance in the place where your wood was supposed to be. Most of the times, it is not easy to identify termite infestation your own. Therefore, if you are buying a new house or renovating your current one, it is always a good idea to call Absolute Pest Control for a complete inspection.